FlexAbility+ PLUS is the highest specification joint supplement available in the UK and is the only joint supplement in the UK with a published, peer reviewed paper in The Journal of Equine Veterinary Science. The study is the largest undertaken in recent history and the findings were also accepted and presented at the British Equine Veterinary Association Congress. The clinical trials suggest for stiff horses, 6-7 out of 10 fed FlexAbility benefit in maintaining normal joint function and mobility. As a UFAS and NOPS approved company, the quality is guaranteed. 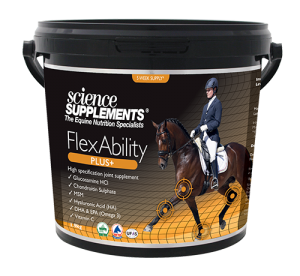 The ingredients contained in FlexAbility+ are both clinically and scientifically proven to benefit the wellbeing of horses. If you are looking for a joint supplement that beats the competition, then click on the image below and see exactly how they compare. Click below for detailed information and feeding guides.